European integration was once thought of as a largely technocratic process built around consensus, but the last decade has seen the work of the EU’s institutions become heavily politicised. Presenting evidence from a new study, Reinout van der Veer highlights just how pervasive the effect of this politicisation has been. Our post-Brexit era makes it hard to imagine that there was once a time in which academia portrayed the European Union as a technocratic, expertise-driven polity that merely offered pareto-efficient answers to border-crossing questions. This consensus has now been shattered. Beginning with the seminal work of Liesbeth Hooghe and Gary Marks in 2009, academics have developed a greater understanding of the extent to which public opinion and domestic politics matter for EU-level outcomes. Various studies have since documented how the politicisation of European integration (the rise in salience of, polarisation of opinions on, and political mobilisation on EU affairs) affects EU politics. But we still implicitly assume the most insulated parts of the EU system continue to operate on the basis of those old technocratic principles. By shifting the focus to the more mundane process of the implementation of EU policy by EU institutions, a new study that I have co-authored with Markus Haverland sheds light on just how pervasive the effect of politicisation on the working of the EU is. We have examined whether the European Commission differentiates its treatment of member states based on the level of politicisation of its activities in these member states. As we already know, the Commission is responsive to such pressures in its role as initiator of EU legislation. We wanted to know whether it is responsive in its more routine and insulated role as supranational watchdog. To this end, we examined the effects of this politicisation on the main outputs of the European Semester, the Country-Specific Recommendations (CSRs), as proposed by the Commission. These CSRs have been issued annually to all member states since 2011, and seek to address current and emerging threats to a member state’s economy and fiscal stance. Note: For more information, see the author’s accompanying journal article. Our most striking findings are presented in the figures above. 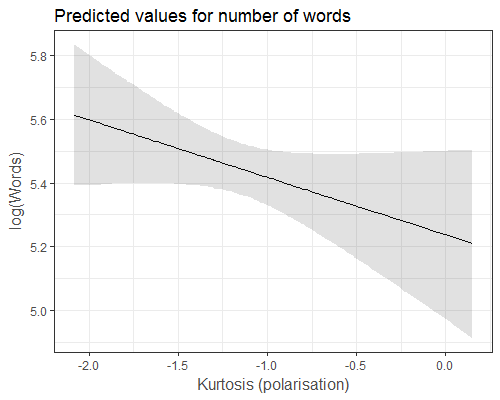 These graphs visualise the effects of rising levels of polarisation of public opinion on the EU (indicated by lower levels of ‘kurtosis’) on both the scope and substance of these Country-Specific Recommendations. First, taking the number of words as a measure of the scope of the EU’s interference in national affairs, we find that the Commission issues more extensive recommendations to member states in which the Commission’s legitimacy is more strongly contested. 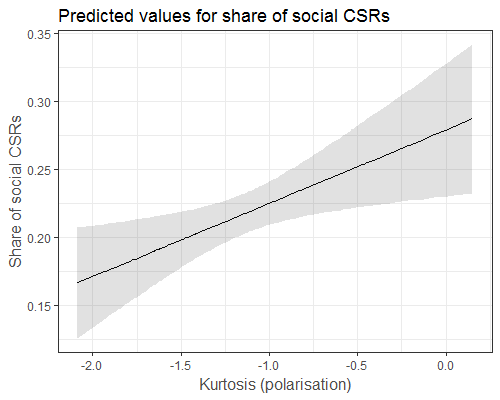 Second, we find that the share of recommendations advocating social investment (i.e. capacitating social policies) over social retrenchment (i.e. austerity) is lower for these countries. Thus, the Commission is not trying to bribe the publics of more Eurosceptic member states by arguing for more spending and protection for disadvantaged groups. Instead, we find evidence for our claim that these effects are part of a broader strategy through which the European Commission seeks to preserve its reputation for key stakeholders. By being stricter with member states in which its behaviour is more politicised, it signals to other member states and financial markets, among others, that it cannot be coerced into leniency. By signalling political independence and supervisory resolve, it seeks to preserve the credibility of the system of EU economic and fiscal supervision. Ironically, it is precisely these member states whose publics are more Eurosceptic that are also more successful in weakening, or watering down, these CSRs during the amendment phase in the Council. And it is also these member states which are least likely to actually act on the Commission’s recommendations. While this raises questions about how the Commission responds to such activities in the Council and vice versa, it also sheds light on just how deeply the EU has been penetrated by the forces of politicisation: even in relatively technocratic procedures like the European Semester, politicisation affects the behaviour of individual actors and the interaction between them. Preliminary results suggest a similar dynamic is at play in the EU’s Excessive Deficit Procedure, one of the most economically significant and politically contested policies in the EU portfolio. While the first member state has yet to be sanctioned under this procedure, statistical evidence suggests member states are more likely to enter into the procedure if their publics have more polarised opinions on the EU. Thus, the further we trace the effects of politicisation to the more insulated elements of the EU polity, the more evidence of its effect we find. This begs the question whether there is any part of the EU system that is not affected by political dynamics and opposition to the EU at the national level. It also raises the question of whether the current political design of the EU is still tenable. If the constant ‘gaming’ of the system by blame-avoiding member states forces EU institutions to unilaterally adopt strategies of depoliticisation to ensure their survival, perhaps a substantial revision of the system is in order. Such a reform could strengthen the role of the European or national parliaments in EU supervision schemes, which can act as lightning rods through which politicisation is captured and injected into EU policy processes in a democratically accountable and sustainable fashion. At any rate, the EU is no longer the insulated, technocratic polity it was once made out to be. Business as usual is dead. Or perhaps a profoundly politicised EU is the new business as usual. Reinout van der Veer is a PhD Candidate in Political Science at the Erasmus University Rotterdam. He studies the responsiveness of insulated, technocratic executives to their wider political context, with a specific interest in the EU, its institutions, and their responsiveness to public opposition. More broadly, he is interested in the role of expertise in democracy, especially in those cases where expertise comes in conflict with popular will.